Every year heading towards the Atlantic Hurricane Season the hype begins about how active it will be. All of the usual experts hype how many, how strong/ace and give practically even odds for large stretches of coastline about where they will go. Most people do not understand that it does not have to be busy to be a very bad season and there is a difference in where hurricanes tend to go in busy seasons vs slow which none of these experts bother to explain. 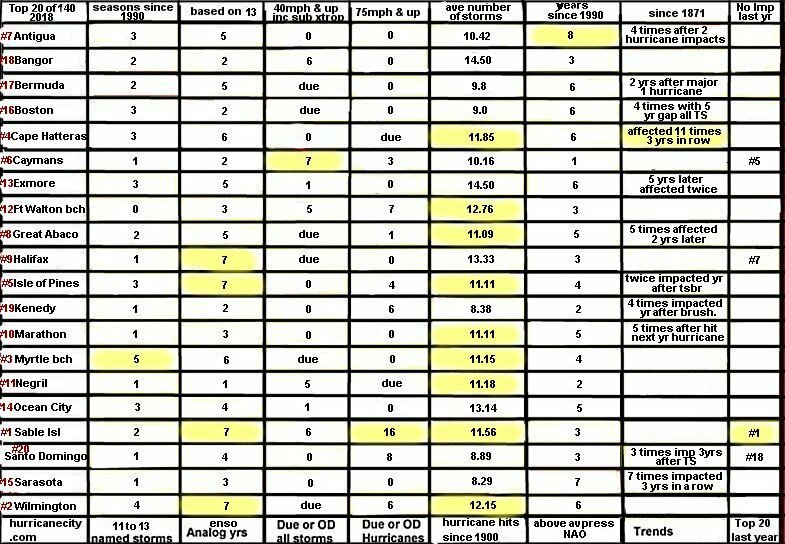 Since 1871 seasons averaging 15 or more named storms have a higher landfall rate in the S.W Caribbean and the northern Gulf with slower seasons east Gulf,S Texas & the N.E U.S. Now this is not always the case as last year proved but Vegas odds makers would go with the stats and be right more than wrong. I used 8 criteria for making my landfall predictions in 2017 which were pretty good considering 3 of my top 5 were impacted and 9 of the remaining 15 were also impacted. The one factor which really caught my attention was the positive North Atlantic Oscillation prediction in April for 2017 in which Marathon,Florida has been impacted in eight seasons with that type of set up. If you think that is nonsense consider right behind Marathon were Antigua & Sarasota with 7 yrs each both hit by hurricanes. Hurricane Irma nearly hit Marathon my #3 pick dead on as a major hurricane causing heavy damage. Normally in a positive NAO cooler sea surface temperatures will exist in the mean development region of the Atlantic. However in 2017 this region was warm which allowed Irma,Jose & Maria to become very powerful hurricanes while approaching the Lesser Antilles more like a negative NAO. Once again this year indications are that we will see a positive NAO and we are already seeing cooler SST’s in the areas where those 3 hurricanes formed. The winner in this category is Antigua impacted 8 times in this type of set up. Another one of my criteria is analog ENSO years in which I have chosen 13 past years that either are starting out similar to where we are at now as far as east pac SST’s or based on what model projections from April 30th are calling for. These similar years are 1955,1958,1968,1979,1990,1996,2001,2003,2006,2008,2009,2012 and 2014. The winners in this category with 7 similar years when named storms affected them are Halifax, Isle of Pines, Sable Island and Wilmington. Close seconds were Myrtle bch & Cape Hatteras, the more I did my calculations the more tracks like 1996 were lining up as a possibility with an increased threat to the Mid Atlantic states. Another factor are return rates & the one area that stands out is the western Caribbean which is not only way overdue for a named storm such as Cayman Islands 7 years and 3 years for a hurricane considering this area gets slammed on a regular basis. Another area overdue for a named storm is Bangor Maine WHAT? 6 years overdue & new to the database . Come on Jim these things never make it up there, wrong as both Hurricanes Edna 1954 and Gerda 1969 which almost hit as a major passed just east of Bangor. Also the area has been affect by 31 systems ranging from extratropical storms to hurricanes. Out of my top 20 locations 9 are overdue for a named storm and 13 are overdue for a hurricane. Speaking of hurricanes another interesting stat is how many named storms during the season when each of my top 20 were hit since 1900. Considering I am calling for 11 to 13 named storms 9 locations fall within this range when they have been hit in the past. An interesting development in this years city picks is that 6 of my chosen 20 were impacted last year which is unusual and also a reminder that return rates are not my only factor for picking my top 20. 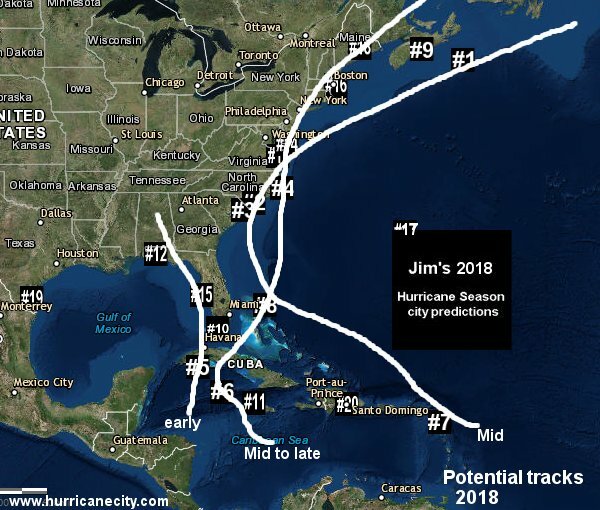 The reason for this is because many of the locations hit last year have some trends from the past to indicate a pattern such as being hit 3 years in a row on numerous occasions or being hit following a major hurricane several times. Before I even pick my top 20 I go through all 140 locations in the HC Database to find the most interesting patterns going back to 1871. One that stands out is Cape Hatteras,North Carolina which has been impacted the past 2 seasons. Believe it or not 11 times this area has been impacted 3 years in a row in various forms. Another stat that is kind of alarming is the Island of Antigua impacted by major hurricanes Irma & Maria has had the island hit the following year 4 times after double impacts which is why they are number 7 and proves it’s not all about return rates. Below is my chart showing the methodology with yellow areas highlighted as the winners in each category which weigh heavy in the top 5. Here is the map that I produce every year for fun,last years was almost dead on. As I always say every year there will be an area or areas that are impacted that I did not pick. One area that comes to mind is the East coast of Florida with no locations in my top 20 other than Marathon. The east coast of Florida has a pretty regular return rate so any year this area is vulnerable. Another area other than Fort Walton bch is the northern Gulf of Mexico which also gets hit frequently especially in busier seasons but the unknown is how busy it will be. What I am trying to say is even though you are not in my top 20 consider last year the north coast of Cuba hit not in my top 20 by Hurricane Irma. Some areas I did pick were not impacted such as Montego Bay,Jamaica & #1 Sable Isl Nova Scotia. In any year regardless of numbers anyone can get impacted but if you are in my top 5 considering nearly 3 out of my top 5 on average are impacted you may want to take this season very seriously. You can see my city predictions including my past predictions with plenty of useful forecast links. I also have a video explanation talking further about how I arrive at my top 20. here , preparation is the key,good luck this year.